from this article, and has no relevant affiliations. Macquarie University does not contribute to the cost of running The Conversation. Find out more. QUT, SAHMRI, Swinburne, Sydney, UNE, UniSA, USC, USQ, UTAS, UWS, VU and Wollongong. which he needed to observe if he wanted to control ‘the narrative’. back to Federation. 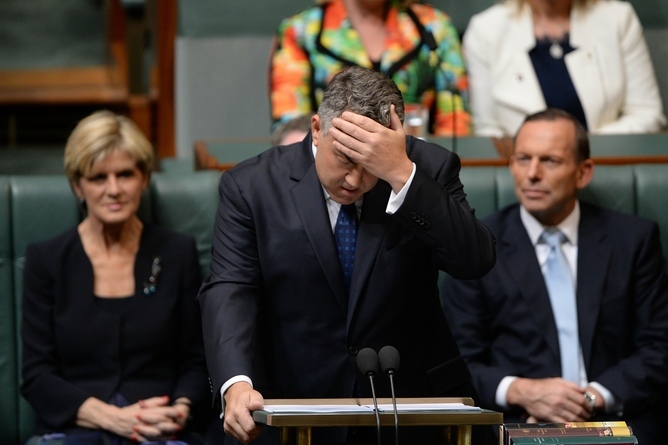 It’s Australia’s equivalent of the State of the Union address. we pay, forecast to be about A$360 billion in the coming financial year. It typically gives a financial outlook statement and positions the government in the context of “where we are now” and “where we are heading”. what they are doing. If they don’t, someone else will do it for them. …is a naturally designed interpreter: so long as it is not dozing, not drunk, not deranged, not dead, it must make a ‘reading’. explain what it has(n’t) done, is(n’t) doing, or will(won’t) do. …a word or formula, as from the Veda, chanted or sung as an incantation or prayer. news – but the mantra needs to have broader and deeper roots. some other narrative will colonise it. have been studying political rhetoric for over 2000 years. …the capacity to see, in relation to a particular subject, the available means of persuasion. 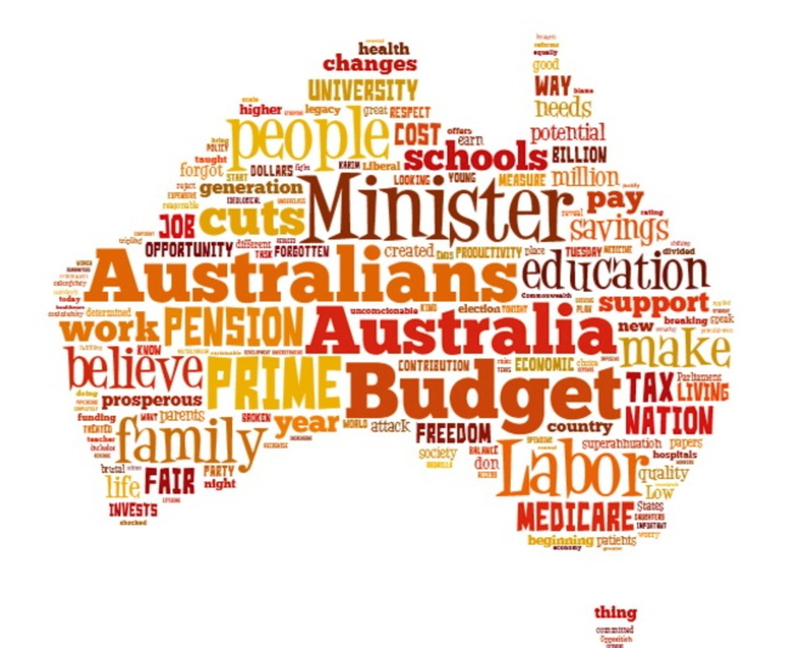 the budget decisions on ordinary Australians. 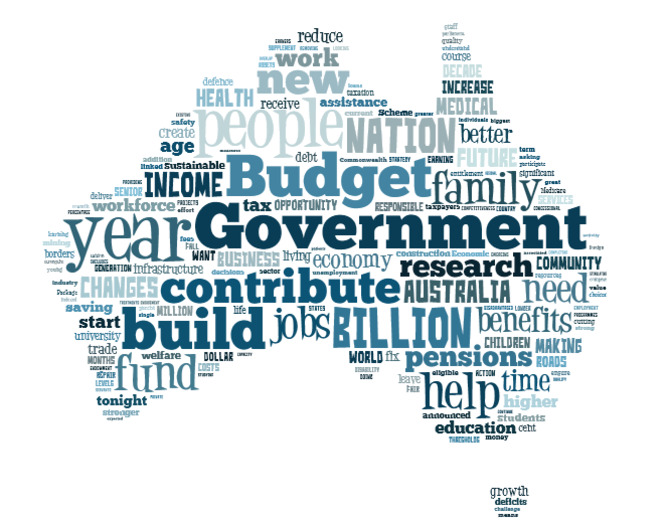 Bill Shorten’s budget reply speech as a word cloud – the biggest words are the most frequently used. to the budget, Hockey failed George Lakoff’s “don’t think of an elephant” test. Joe Hockey’s budget speech as a word cloud. “we” all, equally, hold the destiny of Australia in our hands. its key indicators look into the future. treasurer, rather than just another politician.